Welcome to Most Holy Trinity School, where we offer students in 1st through 8th grade outstanding academics in a faith-filled, family environment. At Most Holy Trinity, we arm your child with the faith, inspiration and knowledge he or she will need to face all of life’s challenges. In addition to our strong academic programs, we are first and foremost a Catholic school that views each child as a gift from God. Our dedicated and trustworthy teachers strive to help their students recognize the special place each one holds in God’s plan, and encourages all children to reach their God-given potential. Students feel welcome at Most Holy Trinity and so will you, as we are very supportive of your role as your child’s primary educator. For 128 years, Most Holy Trinity School has provided a solid foundation for children’s spiritual, academic and social growth by connecting faith to life. This tradition sets the stage for outstanding lives centered on faith and family. Start your own family tradition with us today. Most Holy Trinity School, seeking to fulfill Christ’s mandate to proclaim the Gospel and to restore all things in him, strives to lead its students to the truth for the betterment of this world and in preparation for the age to come. At Most Holy Trinity School, we take pride in a learning environment that nurtures the individual and specific needs of each child. Our highly qualified teachers implement research based instructional methods that help all students excel in high school and beyond. 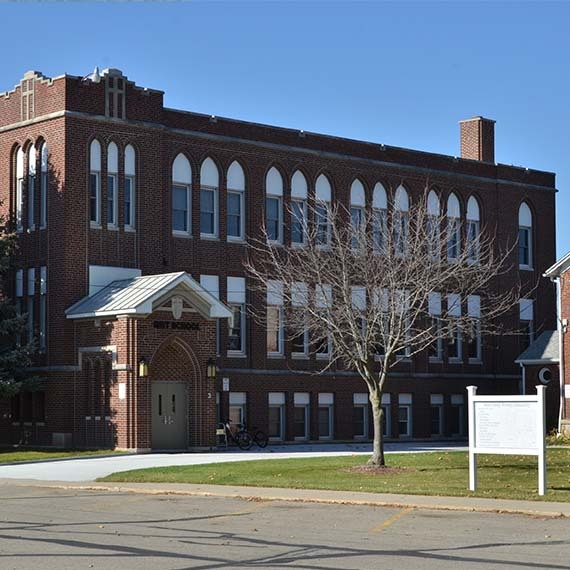 Fully accredited by the Michigan Non-Public School Accrediting Association, we offer low student-teacher ratios and a challenging curriculum. In addition to our core curriculum of religion, math, language arts, science and social studies, we offer music, physical education and computer technology to all grade levels. We also offer band to students in 5th through 8th grade, and art to 7th and 8th graders through a partnership with our local public schools. 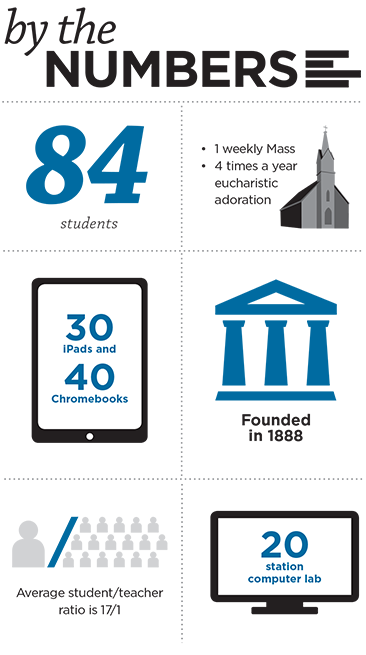 Along with excellent class offerings, our students have the opportunity to use our computer lab, iPads and Chromebooks in a way that blends new technology with traditional teaching methods. At Most Holy Trinity, we teach students that prayer and faith can be integrated into their everyday lives. We begin and end our day in prayer and learn about saints and virtues. Our students attend religion class in each grade level and learn about God through weekly Mass, a monthly practice of the Chaplet of the Divine Mercy devotion and eucharistic adoration. Classes also are invited to lead parish Mass, and participate in sacramental preparation and other faith-based activities throughout the year. A large part of how we live out our faith is through Christian service – our students always are looking for ways to help the community and sponsor events such as veterans’ breakfasts, handing out homemade prayer cards to parishioners and raising money for other charitable causes. As a small school, we offer a range of extracurricular and enrichment activities to help our students experience the benefits of teamwork and strive for excellence both inside and outside of the classroom. Students can sign up for activities such as MATHCOUNTS, science club and middle school student council. Sports teams also are offered at Most Holy Trinity through a partnership with Fowler public schools.